Unless you be stuck in the brig, you should be aware of the recent news involving the Somalian pirates who were recently sniped while holding a US captain hostage. These guys are were not pirates, and it is easy to tell because they did not follow the most important pirate rule (no, it's not "stick to the code"), they did not run away, run away to fight another day. A real pirate would have realized stranded in a life boat is not a preferable bargaining position and would have slipped away quickly. 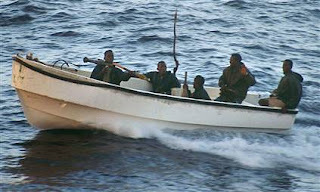 No, the Somalians are not pirates, they are just terrorists with boats, swimming in the axis of evil (anyone seen Cheney lately?) I personally have been a believer of the run away rule for longer than I can remember and it has never let me down...you can't lose a fight you won't win if you don't fight it, savvy? It may also surprise you to know that this is just one story, there are other pirate related activities happening right now. Recently The Pirate Bay guys were found guilty of some form of copyright violation in Sweden or Switzerland (names are unimportant)... either way looks like they are looking at some jail time (pending appeal). I think it was a year... but honestly I am banging this post out on my G1 and I refuse to do any fact finding or further research*. The good news is that their site should stay up (that's what she said) thanks to the physical location of the servers being outside Sweditzerlanden's jurisdiction (bury the booty on a remote island). Pirates everywhere are more than a little miffed by this epic fail of a verdict and as a result Sweden's Pirate Party (yep) has doubled in size and is legitimately looking to join the European Union's Parliament, seriously. They need some 100k votes or something and they are in. I hope they pull it off, any group with an agenda of rum and booty has my support... obviously. *You should probably consider most of the data in this post to be riddled with lies... Pirates prefer dishonesty over honesty as it is typically less labor intensive to be dishonest than honest... honestly. This is actually one of your better posts. Although I did not follow the links - pretty funny nonetheless.